That first picture is priceless…it is the moment you can no longer deny that your son is a soldier. It’s real…he’s wearing green…and he’s on a path you can’t follow, you can’t control. When they are in school, you can complain to the teacher who doesn’t recognize your son’s abilities or the store manager who cheated them because they were talked into buying something they didn’t need. There are so many times as my children have grown that I’ve stepped in – perhaps as some suggest, I do it too often and don’t let them fall enough. There are different parenting modes and I have mine. Sometimes I’ll let them fall, but they’ll know that I’m there to catch them if I can…until the army. I can’t yell at their commanding officer; I can’t convince the army that they should release them an hour earlier or let them sleep that much longer. And so the first time they come home in the uniform, you realize that this son that you have raised so far…is yours…but someone else’s as well. It is the army’s clothes they wear, the army’s discipline and rules they follow. The army will choose when they sleep, when and what they eat…even when they come home. 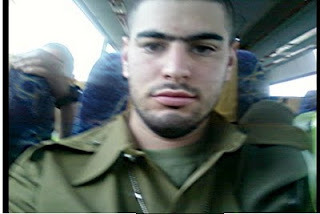 A few hours after Shmulik went off to the induction center, he called me to tell me he was already in uniform and on his way to the base. I asked him to take a picture of himself and send it. He came home this weekend, and I took a few more. I remember the first picture I put up of Elie…only later did the “one” for the blog occur. So, yes, to those who have asked, I’ll be putting pictures up of Shmulik and Chaim (who already has a great picture on my computer and has given me permission) and Yaakov’s picture too (if he’ll let me). A few weeks ago, I wrote of how my youngest daughter had already experienced one brother in the army and Yaakov wrote to me asking how I could have forgotten Elie? Yes, he’s right. Aliza has had TWO brothers finish the army (Elie AND Yaakov) and now has two more in (Shmulik AND Chaim). So, Yaakov – can I put your picture here too? As for Chaim…you’re on the other computer, so I’ll put you up next…along with more pictures…if I can get this blog thing to just upload the picture! Son’s that will make most Parents Proud and also the Nation Proud. I like your blog and would say it good reading! God bless you and the family.